I recently moved into a new apartment, which means for the first time in two years I am living by myself. The pluses to living by yourself are pretty obvious: complete control over what goes on in the apartment, freedom to be naked, and never having to wonder if your roommate is cool with your friends coming over. Additionally we all know there is no greater feeling than getting home and discovering your flatmate is out. There are some plus sides to living with others. Most of my friends are homebodies which becomes problematic for when you want friends to come over. But when you live with someone that no longer becomes an issue. Also whenever I live alone I have irrational fears of choking to death. Perhaps I just don’t like being alone. I guess this is why people get cats. Perhaps I should’ve found a place that allows pets or get friends who are willing to drive. 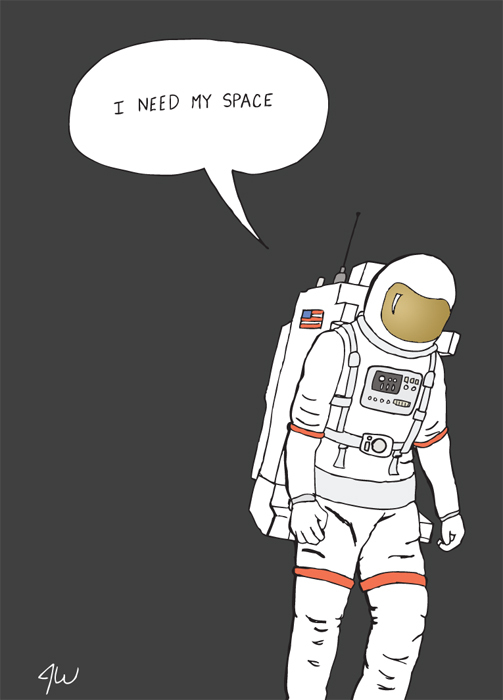 This entry was posted in Uncategorized and tagged Apartment, Apartment Living, astronaut, Roommate, sadsadsad. Bookmark the permalink.